Friends of Roosevelt Park successfully applied for an Arts Project Grant by the Iowa Arts Council to support a 2017 Roosevelt Summer Sundays Concert by The Parranderos Latin Combo. This grant is key in presenting this performance by these highly regarded Latin jazz musicians from Des Moines. 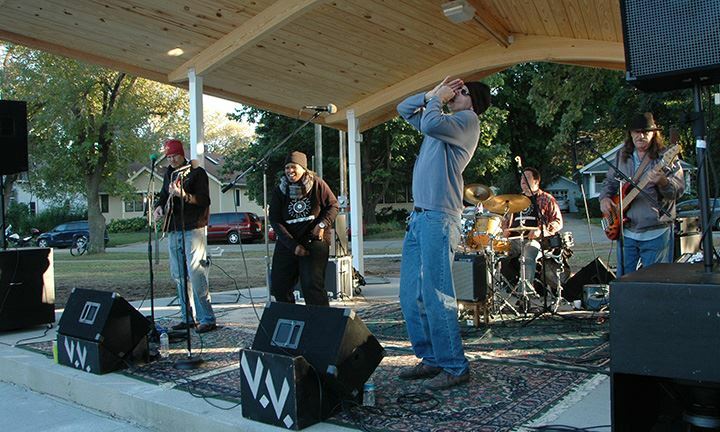 Support for the Parranderos Latin Combo is provided by the Iowa Arts Council, a division of the Iowa Department of Cultural Affairs, and the National Endowment for the Arts. Community support and donations received over our 15 years of hosting concerts have strengthened the concert series and have made it possible for Friends of Roosevelt Park to successfully apply for this grant. We are so thankful to all contributors to Friends of Roosevelt Park, who will fund 11 more concerts in 2017. We are thrilled with our park’s new kiosk, which is made from recycled plastic shopping bags. 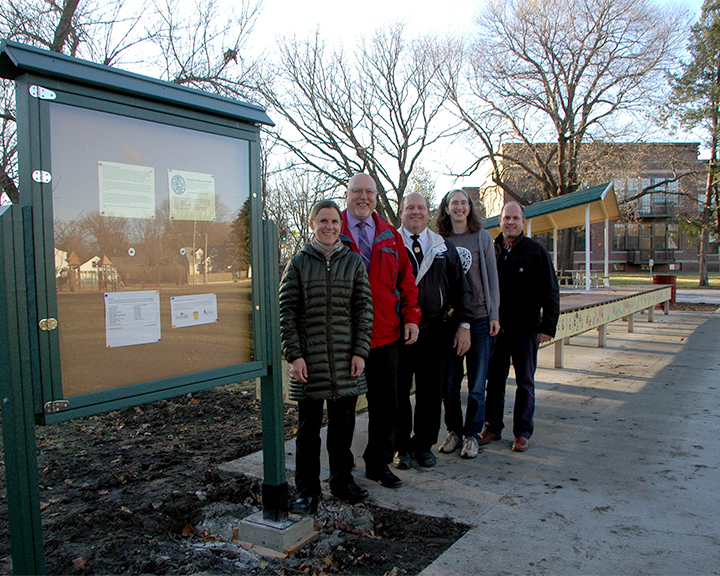 This new kiosk was funded by the Iowa Grocery Industry Association’s Build with Bags Grant Program, which supports the purchase of park amenities constructed from recycled plastics. Thanks are also due to Gary Linehan, Manager of the Ames downtown Fareway for endorsing the grant application written by Friends of Roosevelt Park. The kiosk will help our group promote park events and share neighborhood news. The reverse of the kiosk displays a plaque recognizing the many donors who helped build this beautiful park. 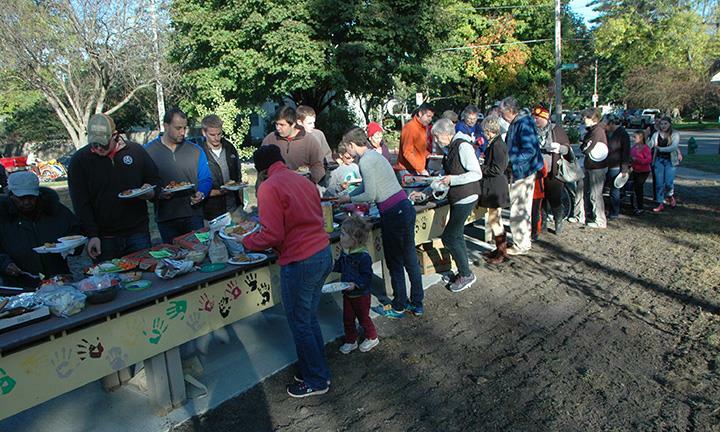 In early October, many of our friends and neighbors gathered for a celebration of Roosevelt Park’s opening. 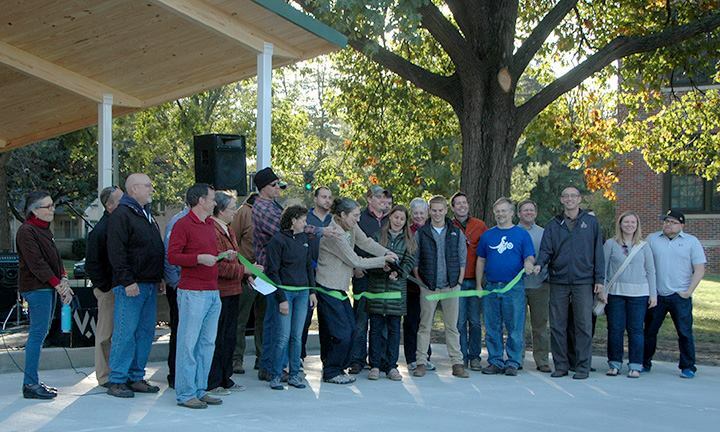 Though the temperatures were chilly, the sun shone on the park’s ribbon cutting, potluck supper, and live music. Mayor Ann Campbell opened the event, with more speeches by Keith Abraham (Director of Parks and Recreation), Tim Rasmussen (Vice President of Ames School Board), Dean Jensen (RES-Development), and Anneke Mundel and Stacey Ross (Friends of Roosevelt Park). A crowd then joined the speakers to cut the ribbon: On the stage with us were elected City officials and City staff, FoRP board members and volunteers, and the students from the local chapter of the National Association of Home Builders (who volunteered to build the stage’s roof). 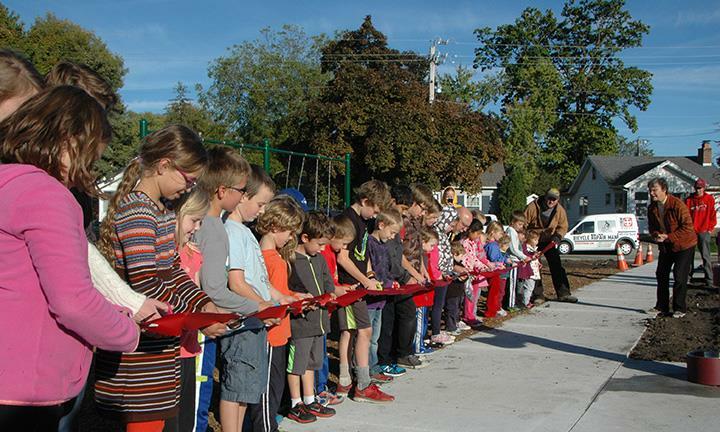 After the ribbon-cutting at the stage, a second ribbon-cutting was held at the playground; a mass of Roosevelt kids, each armed with little scissors, inaugurated the new playground. 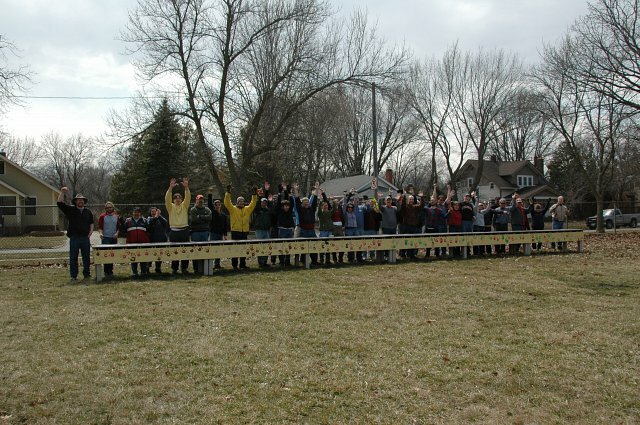 Then, we all gathered for a huge potluck supper which very nearly filled our 50-foot table. So much delicious food was shared, including tasty ice cream cones and hot cocoa donated for our event – thanks Hy-Vee! While folks munched their meals and visited about the park’s features, The Vinyl Vagabonds inaugurated the new concert stage. They put on a great show for us, and tremendous thanks are due, as it was entirely pro bono! Take a moment to follow The Vinyl Vagabonds on Facebook. Visit our Facebook page for more pictures of Roosevelt Park’s Grand Opening and ongoing construction. Sunday, October 4, 2015, 4:30 pm – Enjoy a ribbon-cutting, a potluck supper, a scavenger hunt for kids, lawn games, and free music by The Vinyl Vagabonds [upbeat blues]. For the potluck, please bring a dish to share and your own table-service, beverage, and lawn-chair. rain date: SUN OCT 11. Join us in celebrating our new park! In late April, we presented the community with a challenge: to “continue the legacy of Roosevelt community engagement” by raising $35,000 for the park in two short months. As always, the Roosevelt community rose to the challenge. We did it! We exceed our park development fundraising goal! As of June 30, the close of our campaign, we have raised a whopping $38,731.32, or 110% of our goal through individual donations (totaling about $35,600) and other fundraising activities (the rummage / art / bake sale, t-shirts sales, frozen yogurt, and cookie / lemonade stand). Furthermore, we have been awarded 4 different grants for an additional amount of $8,000: $500 from the Morning Rotary, $500 from the First National Bank (to be formally presented July 19), $2,000 from the Build With Bags program of the Iowa Grocery Industry Association (for a recycled plastic kiosk/notice-board), and $5,000 from the City of Ames Neighborhood Improvement Program (to go toward our stage – pending final authorization by City Council). And, generous neighbors have contributed $8,000 directly to the City Parks & Recreation Department for memorial benches for Roosevelt Park. In other words, together, we have raised almost $55,000 for our treasured park! This will augment the $80,000 already allocated by the City for park development. And … some donations are still rolling in! All of this success will translate into a wonderful concert stage and a mighty fine playground. Thank you, neighbors, for your generosity and for seeing value in this established community-gathering place. We could not have done it without each one of you! Help us choose among two playground options at the Sunday, July 5 concert. Playground options will be available for viewing and discussion starting at 6:30 pm (concert begins at 7:00). Or, visit our Facebook page to see and comment on our options. We hope to order the playground around July 7; construction will be later this summer. Just Released: City’s Master Plan for Roosevelt Park! May 16, 2015: Rummage Sale and Kids’ Art/Bake Sale at Roosevelt Park. Help Friends of Roosevelt Park raise funds to contribute to park development. 1. Help out at the sale – be a super volunteer! You can help with set-up, sales, displaying items, and clearing items away after the sale. We could use your help for just an hour or throughout the sale; we’re flexible. 2. Donate your items for sale. Plan now to set aside your gently used household items, furniture, kitchenwares, and whatnot. We’ll receive stuff at the park just before the sale begins. 3. Create items for sale (kids & their families). We know that the kids of the Roosevelt Neighborhood are passionate about their park. This is the kids’ chance to help raise some dollars for the park’s development. The potluck table will be designated for sale of kids’ artwork, baking, …. etc. Please confirm your willingness to contribute by sending a quick email to contact@rooseveltpark.net. Thank you! April 25, 2015: Tree Planting in Roosevelt Neighborhood by The Ames Foundation. We probably need 20-25 people for the planting from the neighborhood area. Those helping would need to bring shovels, and buckets if they have them, to put some water on the trees after we get them in. Loppers or pruners to cut through existing tree roots would be very helpful as well. Gloves would be very helpful also. Experience planting a tree is not necessary, as we will have some experienced planters helping to “supervise” the work. More details on the meeting time and location for this tree-planting will be forthcoming. Join us in this next chapter of Roosevelt Park’s continued influence in our community. If you enjoy Roosevelt Park or its Summer Sundays concert series, we encourage you to support Friends of Roosevelt Park! (1) Subscribe to our e-newsletter (left side-bar) to learn of volunteer opportunities, community meetings, and more! (2) Assist us with a direct donation. Donations of any size, small or large, private or corporate, are welcome. We are a registered 501c3 nonprofit, so your donations may be tax-deductible.